Australian broadband and cable company Optus has brought back Ricky Gervais for two more ads in which he absolutely, positively couldn't give a damn about what he's pitching. That's the plot of the spots, actually—the same contemptuously meta approach that Optus took earlier this year when it first used the British comedian as a kind of anti-pitchman. Oddly, those earlier ads were a bit more engaging—the new ones don't have quite the same punch. (Maybe he took the idea too seriously.) 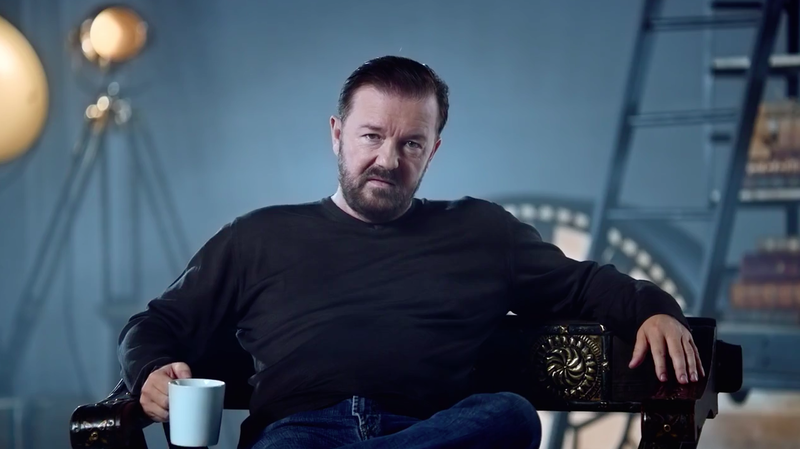 Still, they're good for a chuckle, as Gervais delivers the goods in his trademark stupidly arrogant David Brent style. "The first Ricky piece released earlier this year delivered over 8 million streams with record sharing levels. The audience enjoyed it and wanted more," says Charlie Leahy, executive creative director at agency Emotive. "This follow-up once again allows Ricky to take control of the scripts and deliver it with his globally renowned comedy style. It was a privilege to work in a true collaboration with Ricky and the team at Optus on this content campaign."